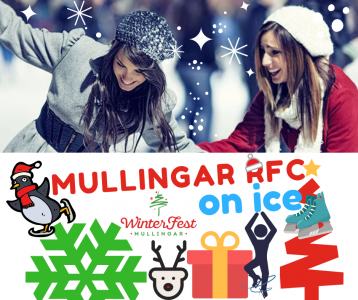 Mullingar Rugby Club are delighted to invite you to join us for a great evening on Ice this Christmas. As part of Winterfest 2018, a Mullingar Chamber initiative, a skating Rink will be in Mullingar Town Park for the duration of this years Festive Season and we will be there as a Club on Sunday 16th of December from 18:40. Tickets are available in our Club Shop for Members and Families (Initially) from next Saturday morning, numbers are limited so GET YOUR SKATES on and guarantee your spot for another super Club Event and remember to wear your Club colours & and woolly hats as Mullingar RFC take to the Ice.